24601. This number had hijacked a man’s identity. 24601 was the prison identification number of Jean Valjean. For 19 long years, Valjean had served hard time for a crime of desperation . . . stealing a loaf of bread for a hungry family member. The shame of this number attempted to control his life. After serving His full sentence for his crime, Valjean was free from the chains of the physical prison, but he would never be free from the shackles of shame his imprisonment brought. For the rest of his life, Valjean would be required to report himself to local authorities as a dangerous man . . . a title that would prevent him from finding a place to live or a job to work. It seemed the chain of his shame was a much more difficult lock to pick than his prison cell. Javert: Now prisoner 24601. Your time is up and your parole’s begun. Do you know what that means? Valjean: Yes, it mean’s I’m free. Javert: No. Follow to the letter your itinerary. This badge of shame you’ll show until you die. It shows you’re a dangerous man. What have I done. Sweet Jesus what have I done. Become a thief in the night, become a dog on the run. Have I fallen so far and is the hour so late that nothing remains but the cry of my hate. In Jean Valjean, we feel the sticky shame of our own sin. The ways in which we all fall short of the glory of God are not things that are easily removed from our psyche, or our eternal report card. God knows all, and our personal sin turns all of us into 24601 . . . a person condemned to die for our transgressions. No matter how much we run, our sin is always known. No matter how much we try to do better, our past is always with us. Romans 6:23a states plainly, “The wages of sin is death.” Our sin chains us to our past, will not let us free, and turns us into thieves in the night and dogs on the run. Our sin is probably not the theft of a loaf of bread, but it is no less damning. Like Valjean, we need a new start, but how can we get it? Again the answer to this question will come in a different post. Meanwhile, Fantine’s dire circumstances have driven her to the street. She ends up selling her hair, teeth, and body for just a few francs. Sitting in the theater, the mind numbing events and debauchery that occur during the song “Lovely Ladies” was almost too much for me to watch. The scenes are not pretty or lust-enducing . . . they are sad and depraved. In this way, I loved this movie. Most of the time, our entertainment outlets try to dress up sin and make it look fun and exciting. Seldom do we see sin and the fall of man for what it is . . . a total waste and sign that something is seriously broken. Fantine’s demise is a perfect reminder to us of the ugliness of sin, the fallenness of the world, and our need for something better. Sin hurts everyone it touches. It destroys individuals, families, relationships, our relationship with God, and even our interaction with creation itself. Sin is ugly. God does not command us to not sin just because He wants to make arbitrary rules. He calls it “sin” and commands us to abstain because it is BAD FOR US. One of Satan’s chief strategies is to make sin look better than righteousness. This strategy has duped people from the beginning. Further, sin and the fall have not only effected people, it effects the systems people build. The French society of “Les Miserables” is terribly broken and unfair. Jean Valjean became a thief because his family was hungry due to the tyranny of revolution. Fantine was pushed toward the street because her husband abandoned her and the patristic environment of the French workforce did not give her a fair shake. Sin’s societal effects are clearly seen in this film. Economist Brian Fikkert recently commented on American’s understanding of sin, both Republicans and Democrats. He commented that Republicans tend to emphasize personal sin and responsibility and ignore sin’s effect on the systems of our world. In this way, they have underestimated sin’s effect. Democrats tend to emphasize the systems and ignore personal sin and responsibility. In this way, they are wrong as well. 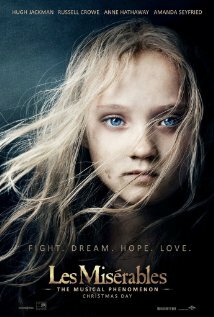 In “Les Miserables” we see the effects of sin on both the individual and the world in which we live. Just as well they never see the hate that’s in your head. Don’t they know they are making love to one already dead. There is no “Pretty Woman” glamour here, just emptiness and brokeness. This is what sin leaves behind. In my first reflection on this movie we saw that the hardness of this life makes us long for something more. In this post, we have seen that the chains of sin prevent us from experiencing that something more. If this was the full substance of the film, it would be merely a tragic tale. However . . . there is more. More posts to come . . .